So, I had some leftover faux leather from the leggings I made and decided to put it to good use. And Simplicity 2054 was currently in my pattern stash and I thought it would fit the bill perfectly. I lengthened the front and back pattern pieces by 3 inches. And the sleeve piece by 1 inch. I should have made the sleeves longer. My alteration wasn't enough so I didn't bother hemming the sleeves. But it works. The pattern is extremely simple. It took me approximately 3 hours from pattern envelope to final steaming. Along with the faux leather, I used a ponteroma knit from Hancock. I stabilized the shoulder seams with clear elastic and serged the seams. The dress is finished with a 1" hem. Worn with boots and necklace, both from BCBG; and clutch (can also be converted to a crossbody) from Nine West. Another LBD for my collection! Great look. I'm sure I have this pattern in my stash because of the interesting sleeve. 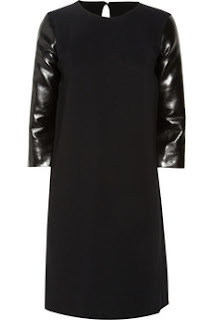 Awesome dress and you have inspired me to combine faux leather with a knit or woven. I just adore this dress. 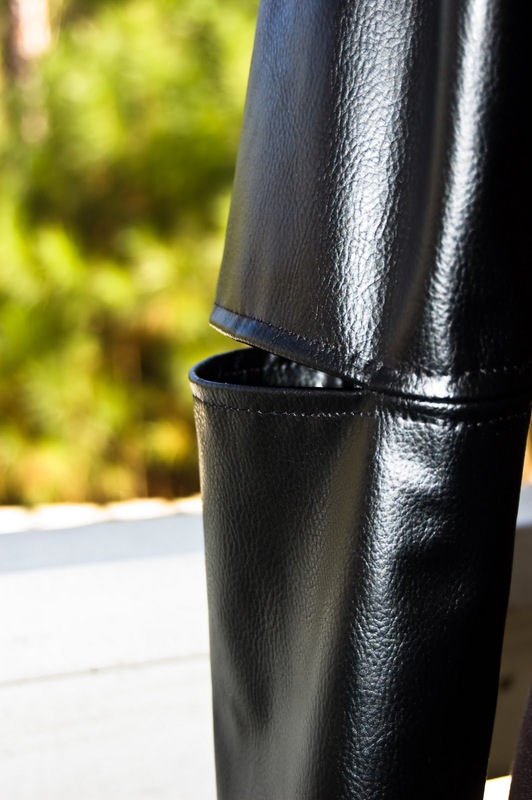 I am really loving all the leather elements people all over the sewing blogosphere are adding. So cool! Leather is so hot and as far as I can tell, it's going to stick around for a while. Very very chic and edgy, and I really adore that slashed elbow detail. A very nice touch! The slashed shoulders in that leather is pretty wicked! You look fierce in this dress! So I have to de-lurk to say how awesome this dress is! You look like you just stepped off the runway and are working it! Hoping that one day I can be as well-dressed as you...thanks for all the great inspiration! OMG-it really does look like the "Stella" dress, except...well, yours has a much more feminine cut and has shape built in, the designer one is blocky. Looks like another pattern goes on my list! LOL! You and Carolyn (Sewing Fanatic?) both really inspire me, you are able to see a pattern that I might otherwise pass by and show how flattering it can be. Outstanding! Perfect way to express the mix materials trend. Thanks Cennetta. I'm loving all things leather! I'd say you nailed the knock off. Great job! Love the peep elbow detail too. Love the dress and can I say I love your 'fro! You knocked off this $$$ dress perfectly. Great garment! This blog post was featured on Simplicity’s Facebook page. I will include the link to the pages so you can have a look. Please invite your followers to see your post on our page. I hope you continue doing wonderful work and include simplicity into your designs. CAN YOU PLEASE MAKE THAT DRESS!!!! I'm in LOVE!!! You know I'm a sucker for leather sleeves (I'm currently working on a coat that way!). The slashed sleeve detail really catched my eye! Well done, you are an inspiration! I want to make a leather sleeve trench coat! Hopefully I'll get around to it before spring! Thanks! B, I didn't use a leather needle. I used a ballpoint needle for knits. Wow, great dress! The faux leather really lifts it from ordinary to fantastic. I'm sure you're getting lots of wear out of it. Jo, when the weather was cool, I did! Thanks!